Bar Length: 3.75" Bar Width: 1.75"
"Milky Way soap mold paw print"
COMMENTS: This soap turns out awesome. Took a little bit to learn to put the soap into the paws but I have mastered this. Just love this soap for all the people that have pets. 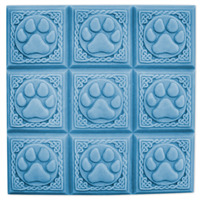 "Milky Way Paw Prints Soap Mold"
COMMENTS: I have a growing line of pet shampoo bars and these molds are prefect! Whimsical yet sturdy, I would definitely recommend these for the dog lovers especially! COMMENTS: Popular with dog and pet lovers. Nice size and shape! COMMENTS: I used oatmeal mp soap in these molds. For the paw print detail, I colored the soap brown and used a dropper to fill in the details. The rest of the mold was filled with the natural colored oatmeal soap. They were adorable. These molds are ideal to use for kids whose school has a mascot with a paw (such as bear paws or tiger paws). Just use the school colors in the soap. "Have plans for this mold"
COMMENTS: I can't wait to make some multi colored soaps with it. This will be great for fundraisers and pet lovers. COMMENTS: I bought this for a sale at our local cat shelter. I made about 30 soaps in this mold and could not believe how fast they sold, brought in a lot of money for our shelter kitties. 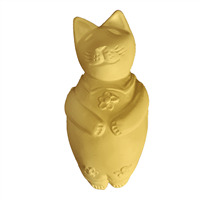 Actually outsold our cat mold. Will definitely be using this mold more, we are now including them in our adoption packages. COMMENTS: Very popular with children who have a dog. COMMENTS: I purchased this mold especially to make soaps for a fund raiser for a friends pet rescue. They sold out very quickly. Very cool mold. COMMENTS: This is the most adorable mold and the M&P soaps pop right out. 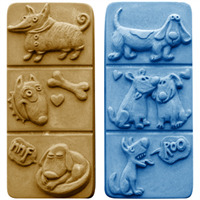 I use it to make soaps for people to use on their precious puppies and the mold itself captures their attention. It would also make a fun gag gift soap for a pet lover. Even people who didn't have pets thought the soaps were cute - you never know when this might cause them to purchase something else you have - good marketing tool. COMMENTS: Cute mold that holds up well. The size is nice and the details are clear on the soap. My customers think it's adorable for their dogs soaps! 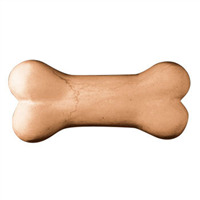 "Great mold for Pet Products!" COMMENTS: I love to use this with the oatmeal base MP for dog shampoo! COMMENTS: These are a hit with adults and kids alike. The details as other postings have said are great. There is a bumpy texture under the paws it isn't just flat. Filling the paws with one color of soap and adding another is easy and they unmold easier than any mold I have. COMMENTS: This is so adorable the details are exquisite. 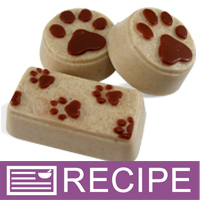 A must have for anyone making doggie soaps or people who just like dogs. COMMENTS: This is such an adorable mold. I have done two Christmas shows this past month and have sold out of soaps made from this mold! Customers love it. 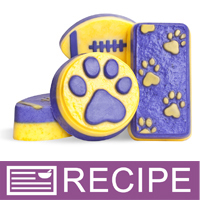 COMMENTS: I BOUGHT THIS MOLD TO MAKE GIFT SOAPS FOR MY GROOMER AND SHE LOVES EVERYTHING WITH PAWS ON IT. SHE WAS THRILLED WITH THE SOAPS. THE DETAIL IS VERY NICE! "It says 1 mold under the pic, which one is it? Or is it a tray of 3?"